Why are the edges of this picture reddish? What's going on with artificial intelligence? If your browser labels this site "Not Secure," don't worry. You are not typing personal information here, so security is not needed. Click here for more explanation. Here are a couple more of my attempts at art photography. In the spring of 2016 I walked around downtown Athens, Georgia, and took pictures of "ghost signs," faded signs, some of which had been temporarily made visible by removal of something else. Most of my pictures weren't very good and serve only to record the location of things to come back to. But I did get two good ones, the iconic Tanner Lumber Company and the forgotten Commercial Hotel. These were taken with an iPhone 5. Where PixInsight comes in is that I used its HDR Multiscale Transform to darken the highlights and brighten the shadows to give a more painting-like look. I also did routine processing of several kinds in Photoshop. Photo by Julie Anne Workman. License: CC-BY-SA 3.0. Click on image. Many plastic objects made about 15 or 20 years ago are deteriorating. This particularly afflicts the grips on cameras, binoculars, and other objects (umbrellas and this fellow's light saber). Getting two of my older cameras out recently, I came across two cases of this, of different kinds. Here's how I dealt with them. In this case the plastic has dried up (lost its plasticizers). Like asphalt, many plastics are a mixture of a hard substance and a lighter, oilier substance that keeps it supple. The cure? STP "Son Of A Gun" Protectant applied very lightly and rubbed off. I did this a couple of times. If you apply too much, you'll leave the surface slippery, but you can clean it off. This product is less oily than Armor All. A German product called Sonax Gummi-Pfleger is also highly recommended. What you do is clean the surface, swab on the Gummi-Pfleger with a Q-tip, leave it there a few minutes, and then wipe off all that has not soaked in. I have not tried this. This is a different problem and is what afflicted my Canon 300D. Applying a bit of "Son Of A Gun" made it worse. So did all other attempts to clean the surface. I was vexed. But then, with the help of the video about a light saber that I linked to earlier, I figured it out. What you have is a thin black rubber coating on top of black plastic. That coating is gone (I'm told it has un-vulcanized itself) and needs to be taken off. Then you'll have clean plastic, shinier than before, good as new except that it has no rubber coating. How do you do that? You need a microfiber cloth that you can sacrifice; I suggest a cheap eyeglass cleaning cloth. (By now all of us have a few of those; they come free with sunglasses, etc.) Wet the cloth generously with isopropyl alcohol and scrub. The sticky coating will come right off, onto the cloth. The process looks messy but very quickly gives a clean result. Some people scrub with a brush or a plastic spudger; I did a bit of scraping with a fingernail. The cloth will have lots of black rubber in it which you can't wash out, so throw it away. Now I have a Canon 300D that is shiny in places where it used to be matte, but that's a lot better than having it as sticky as Scotch tape! While putting the 40D through its paces, I stepped outside and made a bit of art. Canon 40D (a camera I got in 2007 and will be using more, as I readjust my equipment lineup), 40-mm f/2.8 "pancake" lens. Press Ctrl-L. Now your channels are not R, G, and B, but rather L, a, and b, where the latter two are dimensions of hue. Do the same to the b channel. Convert back to RGB and save the image file. The advantage of Lab color is that you can adjust brightness and the two dimensions of color completely independently of each other. Should people buy unusual, expensive things? This is mainly for my fellow Christians, but others will find it of interest if they have similar moral principles. It is written from the perspective of the Christian duty to use material possessions responsibly for the glory of God, rather than for pure self-indulgence. An amateur astronomer who is a Christian just asked me for spiritual advice, and I'd like to run his question and my answer by all of you, while respecting his privacy. His question was whether it was irresponsible for him to spend $6000 on a specialized piece of equipment. Important note: He indicated, and from here on I will assume, that he could afford it without neglecting other duties, that he would get lots of use out of it, and that he wasn't buying it to impress others, but rather because he really had a use for it and a good technical understanding of how it would help him. My reply was: Do not judge your decision by whether other people spend money the same way. Most people don't buy astronomy equipment at all. That's one reason it seems to be a strange thing to be spending money on. If you spent $6000 more than you needed to on a car or a house, nobody would bat an eye and you would probably never even question it yourself. Also, if it is legitimate to spend time on something, it is also legitimate to spend money on it, within reason. Appreciating God's universe is at least as legitimate as watching baseball games or reading novels or going to the beach. The difference is that relatively few people are given the talents and inclination to appreciate the universe the way you do. Also, this is $6000 for an instrument that will last ten years or more and be used very frequently during that time. So my advice is that the purchase is legitimate. But a second part of the question had to do with the fact that similar equipment that would do the job about half as well, or less, can be had for a lot less than $6000. He could limp along, so to speak, for $1000. So is it wasteful to buy the best? Knowing a good bit about this equipment, I don't think so. It's very comparable to the difference between a $1000 car and a $6000 car. The second one is a lot more serviceable and will last you longer. Finally, he asked if he should have used the $6000 to help people (give to the needy) instead. Well, that's between you and God, and if that's what He's telling you to do, I won't stand in the way! But when you buy the $6000 instrument you are not throwing the money away — you are giving people employment, and giving them the satisfaction of making a beautiful and precise instrument, and they in turn are giving other people employment when they spend their money. We Christians do not believe we are obligated to give all our money to the poor — that would just make us poor too. The biggest way we help the poor is by supporting an economy that gives people jobs. From that perspective, spending money on personal interests (that are not actually harmful or destructive) is a good, productive, socially beneficial thing to do. We also don't want to go down the path of saying that precision instruments shouldn't exist — which is what you're saying if you claim no one should buy them. And we certainly don't want to be small-minded people who say "this is frivolous" merely because they are not familiar with it and don't know what it's good for. So I said, given the "important note" above, that as far as I could tell, he was doing the right thing and should be at peace about it. In subsequent conversations on two forums, many wise people agreed with me, and no one raised a serious objection. For the astronomers in the audience, I should add that the equipment was not a telescope but an equatorial mount, motorized and computerized to track the stars. That is actually the part of our apparatus that is undergoing the fastest technical progress these days, and also the part where spending more money buys the biggest increase in performance. Some of us make a hobby of finding low-cost ways to do things, and others, including my correspondent, want to have something reliable and use it regularly without further ado. I didn't have time to do much astronomy last night but didn't want to come away completely empty-handed from one of our rare clear nights. 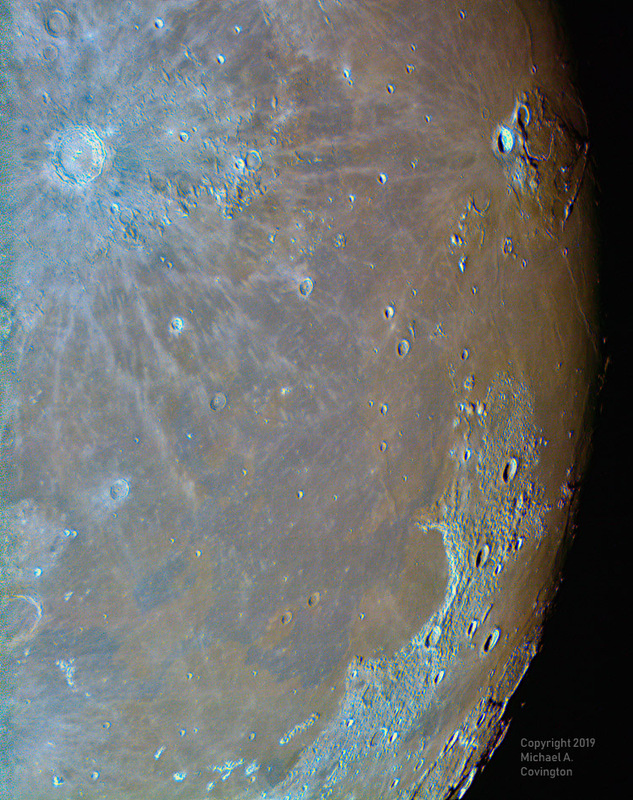 So I put my Celestron 5 (vintage 1980) on its pier and used my ASI120MC-S camera to capture about 3400 video frames of the western part of the moon, then stacked and sharpened them. The reason the colors are so vivid is that I strengthened them with PixInsight. They are real — they're just stronger in the picture than in real life. You can see that different parts of the surface of the moon are made of slightly different minerals. While digging around in the French language yesterday I learned that the word we spell connoisseur is spelled and pronounced connaisseur in French and has been pronounced that way for a long time, even before the spelling changed from oi to ai. So "con-nes-SUHR" is about right if you want to pronounce it in English, and anything with an "oi" or "wa" sound is a hypercorrection. Digging deeper, I learned that the sound /we/ (spelled oi) changed to /ε/ in French a few centuries ago, but the oi spelling hung on. This involved words like connoisseur, connoitre (our word "reconnoiter"), etoit "was," and many others. After a while the French changed the spellings of these words to ai. Under other conditions — I'm not sure what — /we/ changed not to /ε/ but to /wa/ and continued to be spelled oi. An interesting pair of words is français / François. They are the same word except that they went through those sound changes differently. I don't know whether that's because it reached us via a different dialect or because proper names often escape changes that affect the rest of the language; people expect them to be more old-fashioned. On short notice I found and snapped up a good deal on a Nikon D5500 that has had its filter modified to transmit hydrogen-alpha, so I can photograph nebulae with it. I'll test it as soon as it arrives. I have two minds about Nikon versus Canon DSLRs at the moment. Canon has a much more consistent system (same lens mount since the 1990s) and Canons all have "live view shooting" (vibrationless electronic first curtain shutter). But Nikon sensors perform better at present. (Canon is catching up.) And on the third hand, Nikon's raw images are considerably preprocessed, not raw. 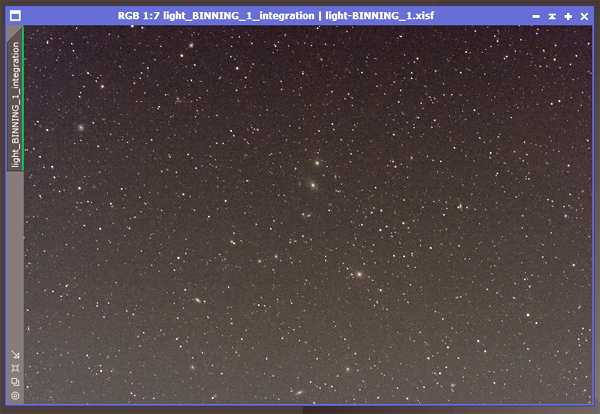 Fortunately the preprocessing is of a kind that benefits astrophotography. So as I continue to straddle the Canon-Nikon fence, another Nikon is joining my fleet, for now. More news soon. 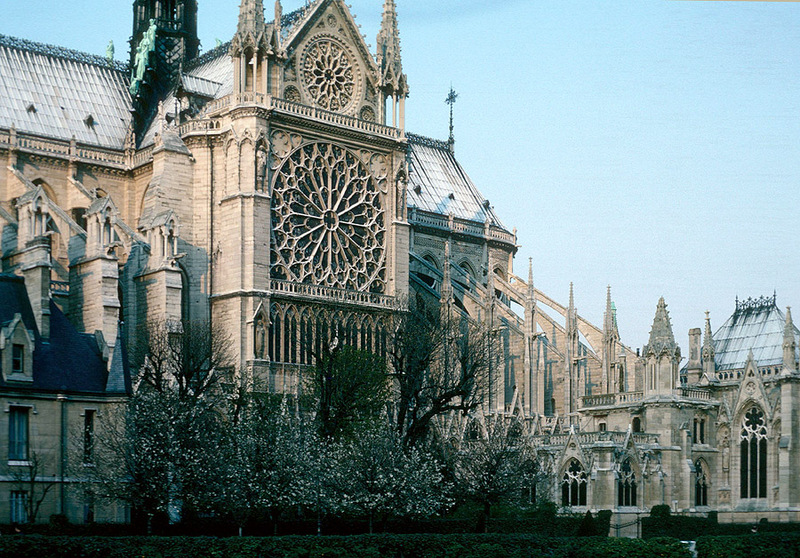 Nous pleurons avec le monde entier l'incendie tragique qui a détruit une grande partie de cette cathédrale aujourd'hui. 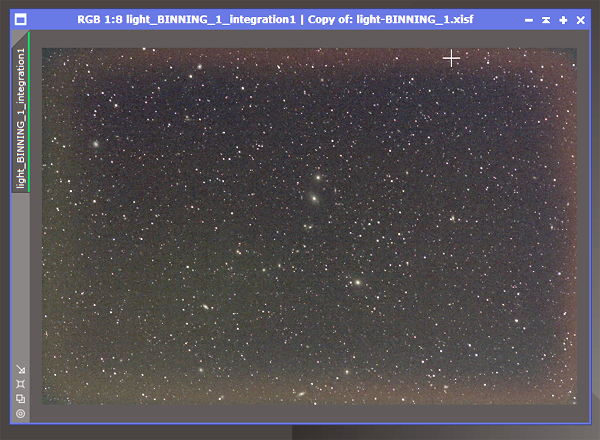 This is my picture of Markarian's Chain during processing. Notice that the edges, especially the bottom and the right edge, are lighter than the middle, and somewhat reddish. Why? First of all, the brightness at the lower left is probably a real gradient in the sky. There was moonlight present. Also, that part of the field was closer to the city lights of Athens. Second, this picture has been flat-fielded. That is, it has been calibrated against a supposedly matching picture, taken with the same lens and camera on the same evening, of a flat light box. That compensates for three things: (1) minor differences in sensitivity between pixels; (2) dust specks on the filter in front of the sensor, if any; and (3) the tendency of all lenses to illuminate the edges and corners slightly less than the center. Without boring you with the details, let me say that I confirmed that the flat-field calibration (including darks and flat darks) was done correctly by comparing three different pieces of software. Note also that lens vignetting, item (3) in the list I just gave, would be circularly symmetrical arould the center rather than lined up in narrow rows along the edges. In fact, there was quite perceptible lens vignetting, and the flat-field calibration removed it. The problem occurred only with my Canon 60Da, which has a special filter that makes it sensitive to longer wavelengths of light. It did not occur with my Nikon D5300. I was almost convinced the sensor in the camera had deteriorated. Such deterioration might easily occur at the edges, which might be less well attached to the heat sink, or the filter, or something. But I kept experimenting. Fortunately, I had kept the camera attached to the lens, with no changes to anything, when I brought it in and put it down on the table. So I was able to perform more experiments on subsequent days, trying various ways of taking flat fields and re-doing the calibration. My light source for the original flats was a small "Visual Plus" light box designed for viewing slides and negatives. I must have had it for 15 years or more. Repeating the flat-fielding with the same light source reproduced the problem. But when I held up the camera and used the daytime sky as a light source — with several layers of handkerchief in front of the lens to dim the light — the problem went away. There was other unevenness, but not the original problem. Then, under more controlled conditions, I used my new AGPtek light box. Problem gone! You can still see a slight difference between the center and the edges, perhaps caused by a smaller but similar illumination problem, or possibly a nonlinearity in the sensor itself. But it's an order of magnitude better than before. Conclusion? The old light box does not diffuse the longer wavelengths of light very well. I can't see this with my eyes, but it must be what's going on. It supplies diffuse light at most visible wavelengths, but at the long-wavelength end of the spectrum, the light must not be evenly diffused across the panel, and thus, to some extent shadows are cast at the edges of the sensor. 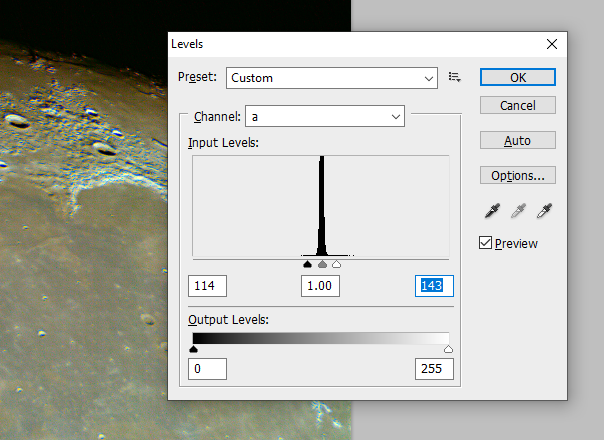 That makes the flat-field image too dark there, resulting in too much brightening when the correction is performed. And only at the red end of the spectrum. The other thing I learned is that there is no such thing as a perfect flat field. Shutter speeds faster than about 1/100 second show uneven shutter motion; no light source is perfectly even; and so on. But most flat fields are better than the ones that were producing the red borders. [Update:] It turned out that the battery in the original light box was very weak, and this may have affected the color and even the diffusion of the light. But even with a fresh battery, the light box does not emit light equally in all relevant directions. I'm switching to the new light box to stay. Last night I needed to continue testing how well my newly overhauled AVX mount will track the stars without guiding corrections, but the crescent moon was in the sky. I decided to photograph M87, the galaxy whose central black hole was imaged by the Event Horizon Telescope project (the image was released yesterday after 2 years of processing). M87 is the brightest galaxy in the picture, at lower left of center. 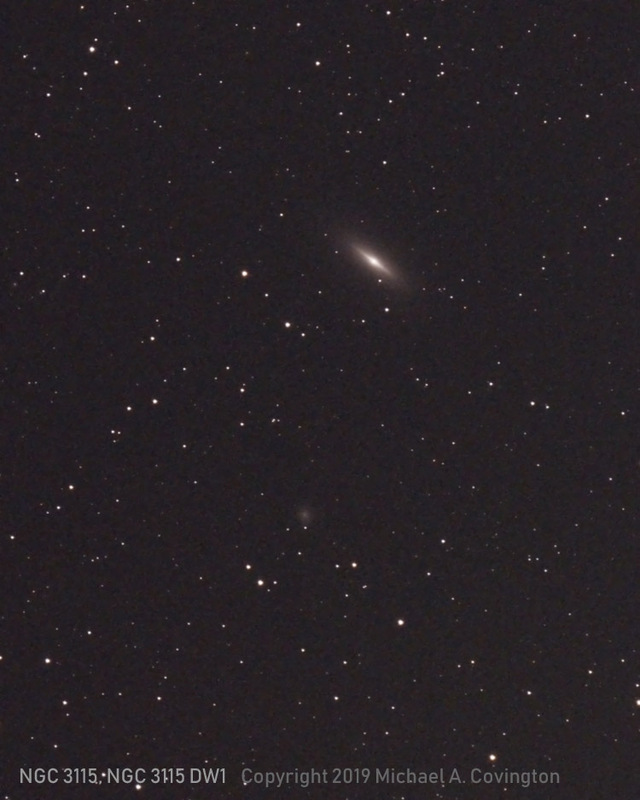 A meteor can be seen faintly to the upper left of M87. 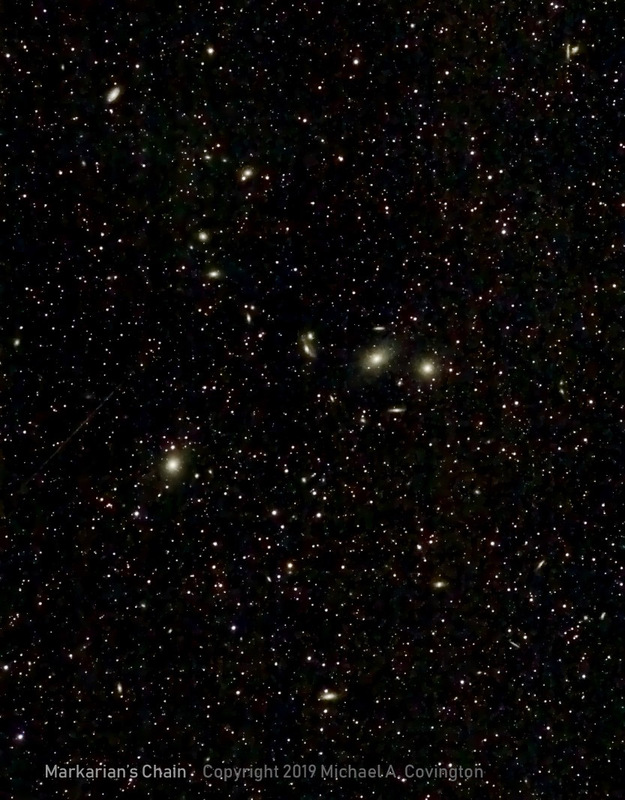 The curved row of galaxies across the middle of the picture is known as Markarian's Chain. Stack of eight 3-minute exposures, Nikon 180/2.8 ED AI lens at f/4, Canon 60Da. The very dark background is due to heavy processing that was needed to overcome moonlight. Arithmetic tells you how to add 123 + 456. Mathematics tells you whether to add 123 + 456. The philosopher Paul Humphreys points out that probabilities cannot all be interpreted as propensities (physical tendencies), though some can. The reason? They work in both directions. When smoking causes cancer, it's a physical effect, so smoking has a physical propensity to cause cancer. But cancer does not cause smoking, so the second probability that I mentioned cannot be a physical propensity. Trying to wipe Jesus off the map? Some atheist writers are now trying to refloat the old notion that "Jesus never existed." Click here for a review. I think this is as silly as it ever was. Somebody founded Christianity, and why shouldn't his name be what people have always said it was? You can question his divinity, miracles, etc., all you want without trying to wipe out the man himself. Nobody tries to wipe out Mohammed, Buddha, or Zoroaster. The underlying question is how much to trust indirect evidence from ancient times. Like it or not, we don't have the birth certificates of people who lived in ancient times, and many of them were not written about (in surviving materials) during their lifetimes (although Jesus comes closer than most). If you set the bar such that the evidence for Jesus is considered insufficient, have you thought about whom else you might also lose? Do you still get to believe in Socrates? Plato? Charlemagne? Where does it stop? And underlying that is the question of how much to respect the honesty and intelligence of people who lived before your own time. A century ago, it was fashionable to be extremely skeptical about everything ancient. My sense is that expert opinion has swung around, and we now realize that people in the ancient world knew more about the ancient world than we do. All of a sudden, artificial intelligence is a hot topic in the news headlines. As someone who has spent a while in this field, I'm often asked my opinion. As AI researchers go, I'm a bit of a skeptic. Here are some key points as I see them. There is no sharp line between artificial intelligence (AI) and other uses of computers. AI is not a specific new invention or breakthrough. The reason for the boom in AI right now is mainly availability of information and computer power. Computers have information on a scale that they never had before. Older techniques are finally productive on a large scale. Machines are not conscious, and there is no known technical path to making them so. The biggest risk is that people are entrusting too much of their lives to automatic systems that they do not understand. I sometimes sum it up by saying, "AI is about half a dozen different things, and some of them are real." To be a little clearer, AI is the use of computers to do things that normally are thought of as requiring human intelligence. One useful criterion is that if you know exactly how something is done, without having to study human performance, then it's computer programming. If you don't know how it's done, but you can study how humans do it and model the process somehow, it's AI. Another criterion is that AI often lives with imperfection. Results are often somewhat approximate or uncertain; the solution to a problem that the computer finds may not be the best solution, though it is usually close; and so on. But this doesn't really distinguish AI from various kinds of mathematical and statistical modeling. AI originated at a conference at Dartmouth in 1956. At the time, brain science was in a primitive state — many experts thought the human was a huge, fast, but simple stimulus-response machine — and at the same time, they were beginning to realize the power of computers, which, to them, actually seemed more sophisticated than the human brain. To a striking extent, the future of AI was already foreseen at that conference. But there was confidence that the intelligence of machines would grow quickly and become more and more like human intelligence; all we needed was technical progress. By 1970 it was clear that the dream was not coming true, and AI started to have ups and downs. Two striking "ups" were around 1986 and around right now. Both, I think, were driven by the sudden availablility of more computer power. Minicomputers and PCs drove the first one; the Internet and the computerization of everyday life are driving the second one. Robotics (where the robot responds to its environment and does not just execute preplanned motions). My specialties are the first and third ones, and I'm doing plenty of useful consulting work for industry right now. Let no one deny that AI has given us a lot of good things. It enables computers to do very useful things with data. Crucially, the greater power we are getting from AI nowadays is due to better computers and more information stored in them, not primarily to AI breakthroughs, though there has certainly been progress. Fifty years ago, nobody could run a pattern recognizer on your shopping habits because the information wasn't available. Many merchants didn't use computers at all. Those that did, stored no more information that absolutely necessary because storage was expensive, and anyhow their computers were all separate. Today, all business is computerized and the Internet ties all the computers together. We also have much more powerful computers. In the 1970s, most universities didn't do AI experiments because they required so much computer time. A day of serious AI work would tie up a computer that could have done hundreds if not thousands of statistical analyses for medical or agricultural research. Nowadays you can outfit an AI lab at Wal-Mart. (Well, Office Depot or Newegg if you want to aim a little higher.) I do most of my work on PCs that are not especially high-end, although rented Azure servers do come into it. "The singularity" is an event predicted by Ray Kurzweil, a time when computers will be vastly more intelligent than human beings and will take over most of our intellectual tasks — essentially, will take over the universe as our evolutionary descendants. Kurzweil's predictions struck me as wildly unrealistic. He assumed that inexorable exponential growth will somehow get us past all obstacles, even the laws of physics. He predicted in 2005 that by 2020, $1,000 would buy a computer comparable in power to the human brain, with an effective clock speed (perhaps achieved by parallelism) of 10,000,000 GHz and 1000 gigabytes of RAM. Well, it's 2020, and a big computer today is more like 3 GHz and 64 GB. Not there yet. And anyway, what do you mean, "a computer comparable in power to the human brain"? That smacks of behaviorist brain science of the 1950s. The one thing we're sure of today is that we don't know how the human brain works. Even without Kurzweil's Singularity, though, are the machines going to take over? Is the time near when computers will do nearly all of mankind's intellectual work and will effectively run the world? I don't think so. If you actually look back at early AI literature (not science fiction), you see that AI today is not very far from what was envisioned in 1956 and although computers will continue to become dramatically more useful, humans will continue to use them as tools, not as replacements for themselves. The real risk, as experience has already demonstrated, is that people are too eager to trust machines, including machines they don't understand. We've been through this before. In the 1950s, computers were often called "electronic brains" or "thinking machines," and lay journalists asked — with at least some seriousness — what the machines were thinking about when they weren't busy. The term "artificial intelligence" makes some people today imagine that the machines are conscious, as does the term "neural network" (a kind of pattern recognizer not particularly related to the brain, despite its name). We don't know how to make a machine conscious. However, we know how to fool people into thinking a machine is conscious. Weizenbaum did that in 1966, with ELIZA, a computerized counselor that would see you type words like "mother" and ask questions like, "Can you tell me more about your mother?" People were sure it really understood their deepest thoughts. More recently, Barbara Grosz has warned us about the damage that could be done by similar tricks in computerized toys for children. A talking doll could teach a child to behave in very unreasonable ways — or even extract private information and send it to a third party. And I haven't even gotten to the issue of entrusting important decisions to machines. I'll return to matters of AI and ethics in another entry soon. Our family has lost one of its most delightfully eccentric members. 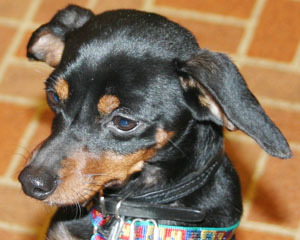 Tycho the miniature pinscher, Cathy's dog since 2005, departed this life yesterday, April 5, in Kentucky. He was Cathy's faithful companion for the past fourteen years and was at least a couple of years old when she adopted him. He had a long life. One of the awkward parts of American income tax law is that when quarterly estimated payments are needed (e.g., from small businesses), the IRS strongly encourages payments of equal amounts at unequal intervals. 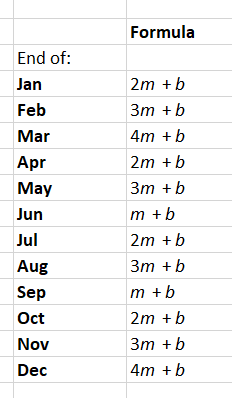 In what follows I'm going to give you some math and a spreadsheet to help you make sure you always have enough money set aside, month by month, to make the payments. Quarterly payments are due on unevenly spaced dates (January 15, April 15, June 15 [gotcha! ], and September 15). That is, they are 3, 2, 3, and 4 months apart. The quarterly payments don't have to be equal, but the IRS strongly encourages it. If you want to pay equal amounts, the Estimated Tax Worksheet tells you how to figure them, and there is a "safe harbor" provision — roughly speaking, if this year's payments would have covered last year's taxes, you're not penalized for underpaying even if your income goes up. You do have to pay the rest of the tax when you file your yearly return, of course. If your income fluctuates a lot, the alternative is to do a lot more accounting (the Annualized Income Installment Method, or at least Form 2210) and figure the tax for each period. In that case, the laws take into account the fact that the periods aren't equal in length. But it's awkward. This is discussed in IRS Publication 505, and you can tell from reading it that the authors seem to have had several contradictory systems in mind. The usual advice is to put the appropriate percentage of your net business income into a savings account as it comes in — typically 25% for federal and 5% for state taxes — and you'll always have enough to make the quarterly payments. But if you want peace of mind, you can do some calculating to fit the steady flow of money to the uneven dates of the payments. Let m be one month's share of your tax payments (1/3 of a fixed quarterly payment), and let b be whatever additional minimum balance you need to maintain in the savings account. This assumes that in the months when you have a payment, it will go out before any further money is set aside. You can click here to download a spreadsheet that calculates it all for you. Fill in the three green boxes, and you're set. Until your business income fluctuates! I didn't expect much from this picture; in particular I didn't expect the blob that you see below center. But there it is. 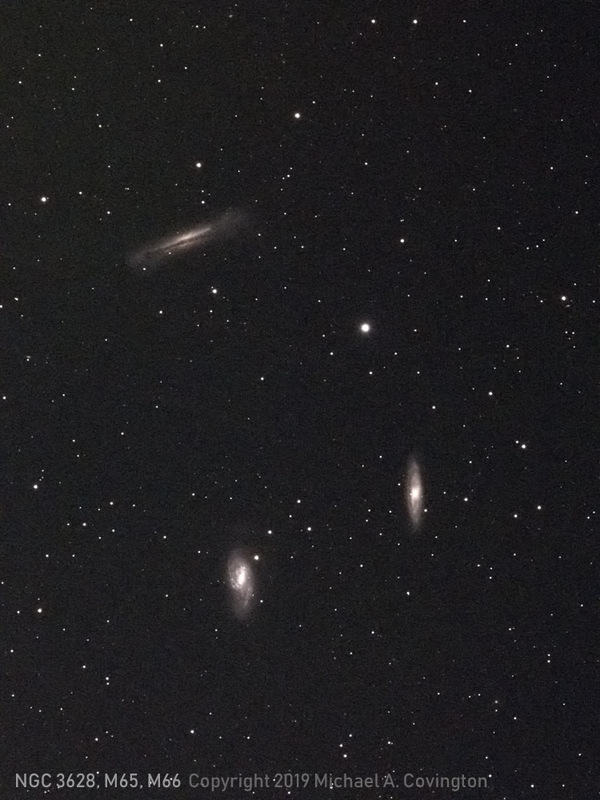 On the evening of April 2, the sky was somewhat murky, but I needed to continue refining the autoguiding settings of the newly overhauled AVX, so I had my AT65EDQ telescope out and took a couple of pictures of galaxies. This is one, actually a stack of eleven 3-minute exposures (6.5-cm aperture, f/6.5, Canon 60Da camera at ISO 800). The edge-on galaxy NGC 3115 was my target, and as you can see, it's plainly visible, though a larger telescope and higher magnification would have helped. There are several kinds of dwarf galaxies. This one is the kind that resembles a large globular cluster. In fact, there seems to be a continuum from globular clusters (on the outskirts of big galaxies) to compact, spheroidal dwarf galaxies, although anything one might say about classifying them has been disputed. Following this up led me to a very interesting project to discover dwarf galaxies with amateur telescopes. Amateur astronomy continues to rejoin cutting-edge science, after having been left behind around 1970. It seems that amateurs' penchant for pretty pictures of distant galaxies has led to exactly the right technology for finding faint dwarf galaxies. If I stumbled on this one (not a new discovery, but not a well-known object either) under poor conditions with a telescope no bigger around than my fist, what about trying a remote-controlled 20-inch at a very dark site? And that is exactly what the DGSAT Project is aiming to do. I wish them success! The latest release (0.19.0) of Stellarium, free star and planet mapping software, has fixed the problems that I mentioned during the past year, including field-of-view indicators and trouble computing the position of Jupiter's Great Red Spot. I am using it and heartily recommend it. I know I'm repeating myself — I've taken much the same picture before — but here is the famous Leo Triplet or Leo Triplets (the word triplet can mean either a trio or a member of a trio). Stack of ten 3-minute exposures from the same autoguider-testing session as the image of NGC 3115 above. The weather hasn't allowed me to do much astrophotography since getting the AVX overhauled, so I'm still in equipment-shakedown mode, trying to become familiar with its performance, which is modestly improved. I'm also changing my technique in various ways and will be doing more autoguiding. My key conclusion from recent tests is that when periodic error is well controlled, polar alignment becomes the limiting factor for unguided exposures. So I'm starting to do guidescope-assisted polar alignment (which requires the computer at the beginning of the session but not throughout it) and will probably end up doing more autoguiding too. 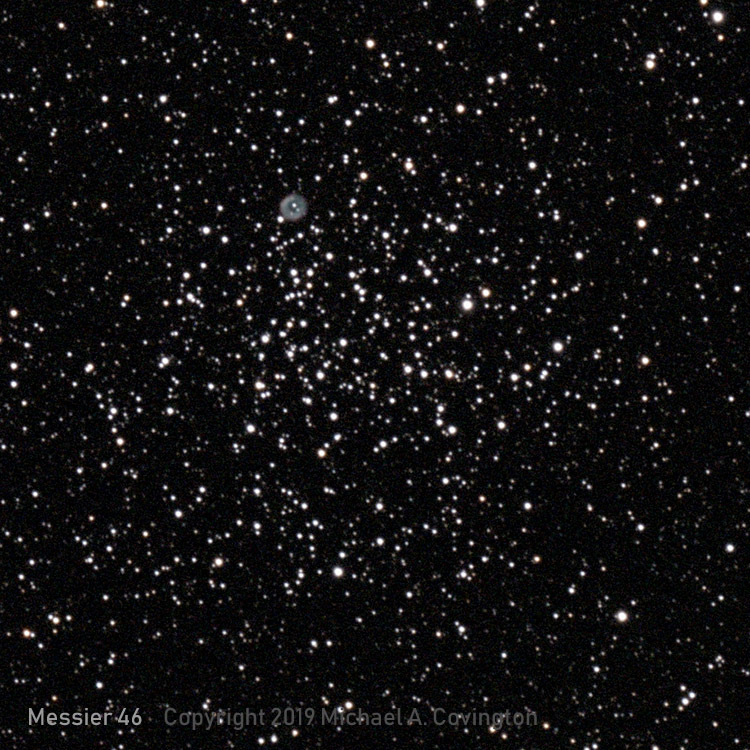 So it was last night, when — hurrying ahead of incoming clouds — I took a series of autoguided 3-minute exposures of star cluster M46 and planetary nebula NGC 2438. New measurements by the Gaia orbiting observatory show that the nebula is in front of the cluster, less than half as far away. For a long time it was thought to be in the cluster or even behind it. Six of the exposures were stacked to make the picture you see above. 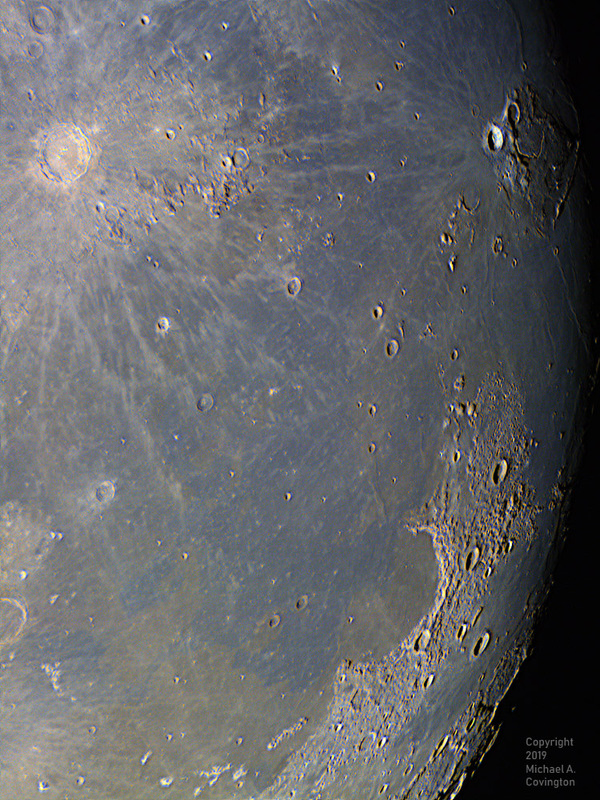 AT65EDQ refractor, Canon 60Da at ISO 800. You can see stars down to magnitude 16.5 if not fainter. Not bad for a telescope two and a half inches in diameter! Today is the 37th anniversary of my last day at Yale; I stayed an extra day to avoid finishing my Ph.D. on April Fools' Day. Major Daily Notebook entries are about to be written. I'm going to tackle artificial intelligence ethics (a hot topic), and then an even hotter topic, which we'll get to. Stay tuned! Copyright 2019 Michael A. Covington. Portrait at top of page by Sharon Covington.